Canada this week adopted a great sense of humor along with its Burger King takeover. But who among us hasn’t accidentally refused to stop and ask for directions and ended up in a war zone…wearing a uniform of an enemy combatant? Right? No? The Kiev government said they had been on a ‘special mission’ “linked to the pro-Russian separatist rebellions in the east,” the report said. The flow of weapons and armored vehicles into eastern Ukraine has been consistent these past few weeks, Pentagon spokesman Army Col. Steve Warren told reporters Monday, which reflects Russia’s intent to cement its mission in Ukraine regardless of backlash. And now the artillery – and more soldiers – are zeroing in on new territory in southeast Ukraine down to the Azov Sea, Reuters said. 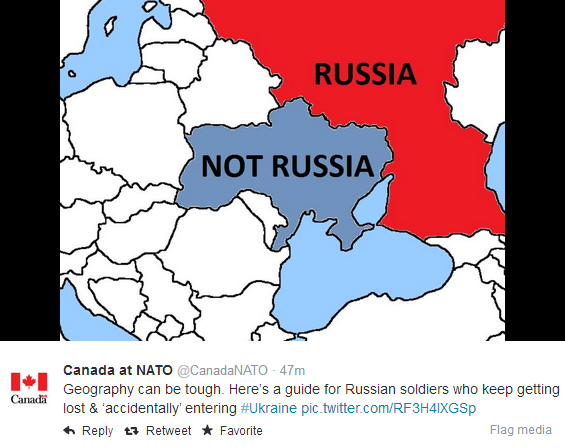 While the @CanadaNATO Twitter account is not verified, it is linked to official government pages. The tweet has been retweeted over 20,000 times.